Feb. 8, 2013. 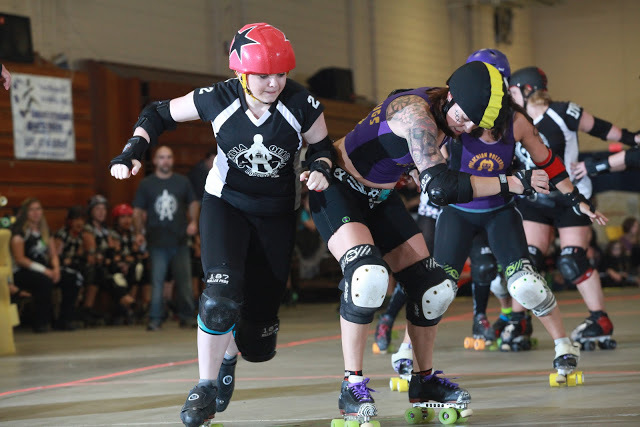 Starting off the new year with a loss has fueled the Appalachian Rollergirls (ARG) to improve their teamwork and team dynamics for their 2013 season! ARG traveled to Columbia, South Carolina at the end of January to bout the Miss B-Havers. “After taking the month of December off from derby practice, we only had 3 weeks of preparation for this bout. Not only were we focusing on conditioning and strategy during this short period of time, but we were also learning the rule changes that just went into effect for the 2013 season and beyond.” said Doc Holidaze, aka Cori Holiday, Biology instructor at CCC&TI of Watauga. ARG had a rough first half but came back for the second half by out scoring the other team by 14 points. “The second half was different than first because we had a new game plan. Coach asked each of us to make an improvement from the first half and we did! I’m really proud of the team for staying positive and giving 100%. Our newer players have really stepped up their gameplay,” said president of ARG Ashley Laws aka Ashinator, student and bar tender. The league was founded in March, 2010 and is now approaching their third season. “I’m so excited for this season! Most of us started playing with little to no derby knowledge or experience whatsoever and it’s taken tons of hard work to get to where we’re at now. We’re skating at a much more mature level and are really having to trust and count on everyone to work together in order to be successful. I think our bout this past weekend showed that this was some of our best group dynamics and level of determination our team has ever reached and it’s going to to stand out even more as the 2013 season unfolds! ” said Eliza Hare aka Jabs Bunny, an official health associate. In preparation for the 2013 season the team will be fundraising and helping around the community, otherwise they do not have a home game until May 4th at the George M. Holmes center on ASU campus. For information on the season and ticket sales go to www.appalachianrollergirls.com and become a fan on Facebook.